We all had the experience, especially as children, where we did something or acted in a way where we made a mistake. Some adult, normally a parent, in the process of scolding us, would say: “what were you thinking?” Strange, we would not consider that whatever we did was actually created in our thoughts and that we then acted it out. Interesting is that when you make the statement in Afrikaans, it goes “wat het jou besiel”. Directly translated it says “what have you souled?’ This is truly strange – the soul and thinking linked together. What is thinking? It seems to be a place where we have our own council. We consider words, experiences, pictures, feelings and discussions. We make our mind up about this and then either speak the words we have come to as a conclusion or act out our conclusion. The actual creation process though happens in the mind as thought. When we have used these thoughts enough, and it becomes automatic, it ends up as part of our identity. Our identity is our unique characteristic we will call eventually our personality. Our Personality is the part of ourselves we normally accept and state that cannot be changed. That is strange. If we can understand how we created something, we are able to change this. What is the point? It seems that the words indicate that the soul is thought. The nature of thought then is the Nature of Soul and the Nature of Personality. That does not indicate much worth while for the hereafter when we return to the soul apparently. What we have found through the interdimensional portal was that the soul construct was preprogrammed. That means that the Nature of our thoughts, our personality and experience in this world, was pre-programmed before birth. This would mean that whether you will be good or bad, rich or poor, religious or not, raped or not, when or how you will be killed is preprogrammed. No choice. This we found strange, because we experience ourselves as having choice. Not really when we consider the nature or our inner experience, which are various ways of thinking, and it determines what we will predictably do in different situations. Very few beings have ever overcome this. In fact, we found that virtually all human beings believe that thinking is an indication that they are alive. Strange. No-one considers the obvious choice. Stop thinking for a day, a week and find out if you die. Find out what is thinking. You will find that it is fear of loss and fear of death that prevents us from entering a state of no thinking. Thus we have equated thinking as life and defined our lives as thinking. This has irrationally become a part of the nature of thinking and our definition of life. It is as if our thoughts confirm that we are alive in some way. But consider your thoughts for a day, then a week and then a month. Honestly write them down. All your observations and thoughts about every-one in your life, your fears and denials – that means the thoughts that appear but you refuse to have them and suppress them. Look at all your thoughts. You will be surprised. No thought is really ever beneficial for all of mankind. You are always the centre of your thoughts and always right. One of the few cases where you become the ultimate victim is when you fall in love and shift this centre of importance in your thoughts to another being. Automatically you must eventually return to yourself and evict the thoughts of another from your mind which happens when relationship ends. The best way normally used is justification by falling in love with another, replace the one centre of attention with another and use that as an excuse. “I no longer love you or I love another”. Never self in the true sense. Love of success, money, possessions – All things that will not last this life. Fascinating, this nature of thinking. Imagine – all existence, all thinking revolves around survival and we have equated survival with money – we have made survival equal to having money. Thus our primary thought is about survival or in a more positive sense – security. Money is the Root of the MIND – The Root of consciousness. How did we come to accept that money is the centre of our world, of our existence? A piece of paper we give value to. The piece of paper has no value but the value we have all agreed to give it. We are in fact enslaved to a value we gave a piece of paper. We let people starve because they don’t have a piece of paper that we have valued. What have become of man’s values: All values placed in survival. This survival based on a piece of paper called money. 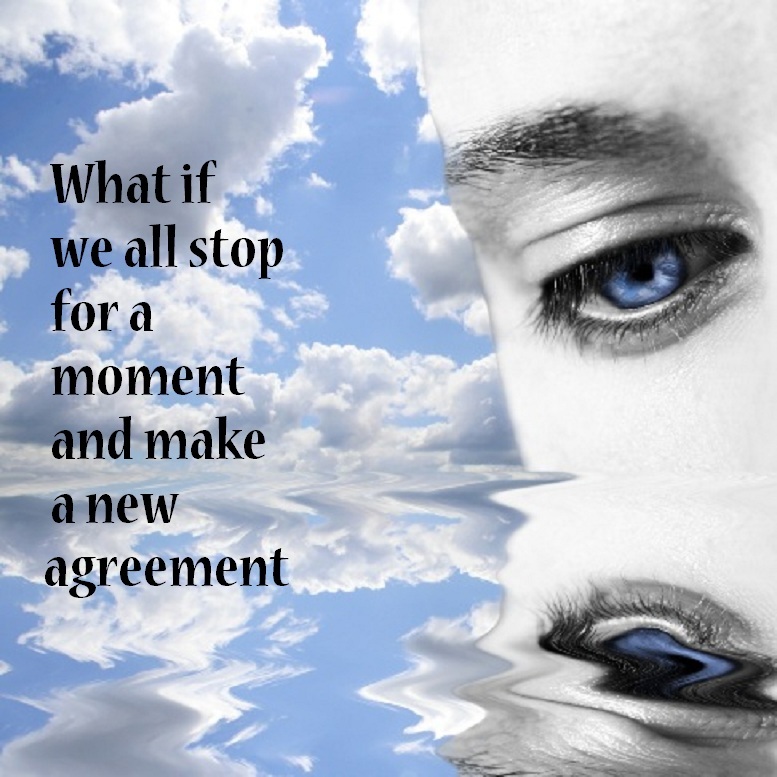 What if we all stop for a moment and make a new agreement. Look at it. We all have agreed to place value on a piece of paper, called money. We all have agreed on the rules that make this money move. We all have agreed that this money holds the power of life and death as seen in starvation. What if we agree to value life and equate this life of a new born baby to money – true value. What if we then give each being born, enough money to be able to live without fear of loss and in free choice of self expression? What will change if none of us need money for survival? The reason for war will stop. The reason for control will stop. The reason for ‘What were you thinking’ will stop. The central attention of all thoughts based on thoughts, based on survival and money will stop. Thoughts as Money will no longer be our Gods. Now we will have to consider self expression where the search for money or survival is no longer the centre of our attention. The world will change. The creation of goods to sell just to make profit will change. Greed will stop. The way of our profit now gives the prophet an easy prediction of the future of the world. The world is the result of our will. The world is the result of the value we place in the words through our thoughts. Our thoughts are our inner reality that shows our real truth – Our real fears and desires. Look, it is all based in some way on money. We have the power to change this. We have the power to change the value of money. We have the power to value life and creation. We will have to. Any prophet can see that profit is destroying existence. How long before it will have an effect on every household? The same pattern as in nature with extinction will immerge as man extinct man self through the value placed on thoughts and money. Soon, we will be forced to reconsider existence, choice and value. Will we be ready to give up what and where we have placed value in? This entry was posted on September 15, 2011, in Uncategorized and tagged Bernard Poolman, breath, creation, Desteni, destonian, destonians, earth, Equal Money, equality, extiction, honor, life, Physical Reality, Process, sekf forgiveness, Self-Willed Equa, thinking, thoughts, Universal Equality, Universe, world equality.